Well I have been searching for a cutting set that was simple...Ideally I wanted a small simple handle and a silver set. One would think it was NOT that complicated but really it was. We ran into these at Hobby Lobby and it was 50% off their bridal stuff so we snagged it and figure we could return it if we didn't find anything better. I didn't want to spend a lot on this as we are not engraving it nor do we plan to keep it. Jeff wasn't thrilled about the heart shape but it was the one set we sort of agreed on and I can bead to match the toasting flutes. So after looking at two other stores he agreed this was the set. 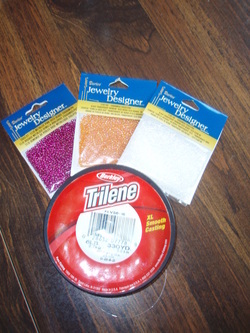 Now I get to bead it up! Here are the tools....same as the toasting flutes!